Juan Pablo Montoya is out of Formula 1 - and he's going back to the United States to drive in the NASCAR Nextel Cup. There had been suggestions that he would join Chip Ganassi once again but it was a surprise that this should be in NASCAR. 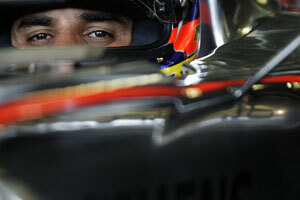 Montoya had no opportunities left in F1 after failing to impress at McLaren. Montoya left Ganassi back in 2000 but did not enjoy the success that had been hoped for in F1. His attitude towards racing was not seen as being very serious although it was clear that he had enormous natural talent. Montoya sees NASCAR as a place to go racing again but he may find the lifestyle a bit of a shock as there is non-stop action from February to November. Montoya won seven Grands Prix in F1. The announcement was made on Sunday by the Ganassi team and the word is that Montoya will race the Texaco/Havoline Dodge. As a former CART Champion and Indy 500 winner there was little left for Montoya to prove in US open-wheeler racing.